Make-A-Wish Mid-Atlantic is hosting their second-annual Night Under the Stars celebration on Nov. 1, and you are invited! What could be better than a magical evening of wish granting, all for an amazing cause? Make-A-Wish Mid-Atlantic’s Young Professionals Council (YPC) has been planning this fantastic event all year long, and the event is meant to provide a fun and philanthropic platform for young professionals everywhere. Held in Washington DC, a Night Under the Stars will be an excellent experience for young professionals of all backgrounds and industries. Guests over the age or 21 will enjoy an open bar, hors d’oeuvres, and live music. Guests can also bid on silent auction items, network with one another, and hear the story of a local Wish Kid, all while overlooking the Capitol Building. 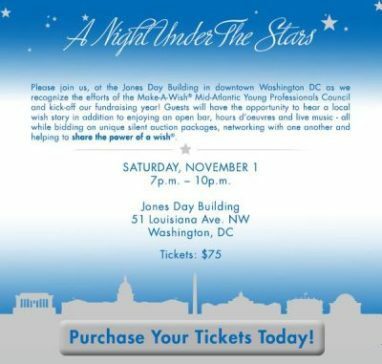 A Night Under the Stars takes place from 7-10 p.m. on Nov. 1 at the Jones Day Building in Washington DC. Purchase your ticket for $75 each and help to grant a wish for a child in the Mid-Atlantic region. You can help to make wishes come true just by attending! If you are interested, you may also donate to the event or donate a silent auction item. Sponsorship opportunities are still available and can help to support Make-A-Wish Mid-Atlantic in their mission to grant wishes for children in Delaware, the District of Columbia, Maryland and northern Virginia (Alexandria, Arlington, Fairfax, Fauquier, Loudoun and Prince William counties). Become a Joy Sponsor for $1,000, a Strength Sponsor for $2,500, a Hope Sponsor for $5,000, a Wish Sponsor for $7,500, or a Star Sponsor for $10,000. Learn about sponsorship benefits here. To learn more about Make-A-Wish Mid-Atlantic’s Young Professionals Council, please email Becca Werner at bwerner@midatlantic.wish.org. Can’t Attend But Still Want To Help? If you are a young professional who cannot attend a Night Under the Stars but would still like to help Make-A-Wish Mid-Atlantic, consider car donation instead. If you are ready to get rid of the first vehicle you ever owned, or maybe you are ready to upgrade your current make or model to something newer, donate your car, truck, boat, or motorcycle to Wheels For Wishes, benefiting Make-A-Wish Mid-Atlantic. Make-A-Wish Mid-Atlantic has granted more than 8,000 wishes to local children since the start of the chapter in 1983, and you can help this number grow by donating a car to Wheels For Wishes. Donate your car today by calling 1-877-431-9474 or by filling out an online vehicle donation form. Your donation will help to bring hope, strength, and joy back into the life of a local child! A Night Under the Stars is just one night of entertainment for you, but when a child has their greatest wish granted, it can change their life forever.